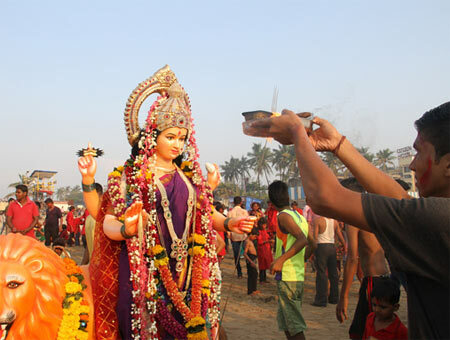 People religiously take part in Aarti of Maa Durga dedicated to the Goddess. Explore Arti of Shri Durga Maa in this article. Maa Durga Aarti - Ma Durga is the epitome of powerful cosmic divine force and must be propitiated with special pujas and rites for devotees seeking her blessings. Invested with powers of the gods, Ma Shakti manifests in nine divine forms. ‘Gauri’ and ‘Ambika’ are some of the names by which she is propitiated. The Goddess is known to give her blessings to the devotee who is most persevering in his or her efforts to please her. During Durga puja festival, people all over the country celebrate with immense devotion. Thus, public venues are prepared to install the idols of Maa Durga with ample cooperation of the community and the states. All the sacred rites and rituals are followed while performing the puja on a big scale. Also, temples organize special puja during the Navratri. The most significant part that devotees participate in is the 'Aarti'. The ‘aarti’ dedicated to Ma Durga extol the virtues of Ma Shakti in her various forms and has a special uplifting effect. The ‘arti’ is performed thrice every day during the puja and is followed by lively bhajan sessions. It has a lyrical quality and people assemble to participate especially for the ‘arti’ and partake of the ‘bhog’ or ‘prasad’ which follows ‘aarti’.